I've been blogging and getting involved with the blogger community for a short while now. It's come to my attention that it's nothing like I thought it would be, I never used to interact nor follow or even read other blogs. I wrote my blog for me and to document my daughters life. While I still do blog for those same reasons I wanted to start trying to socialise with other bloggers and become more involved with the community. While I have made some great friends and also now stalk so many fellow bloggers and really enjoying reading my favorite blogs it's also been very clear to me at just how bitter the community can be too. I feel like I can't sit and pretend everything's all rosy because it's so not. I have experienced what I am unfortunately having to go into depths about I'm not just ranting for nothing. It's such a shame as I feel although it doesn't put me off blogging particularly, it might ruin it for someone else. When I was a real newbie I come to quite a few bloggers (no names are being shared here!) and genuinely asked for help but no one would give out their secrets. Sure, they'll write a post with tips about building traffic and such but when it comes to the nitty gritty bits they wouldn't dare share. I've had friends come to me with the same issue too. It's not just me with these views. I realise there's a great deal of competitiveness in blogging and we all want lots of followers, views, pr's and to eventually perhaps be earning a wage even one day. But come on at the end of the day we are all doing the same thing here. Logging, documenting and remembering our family's memories, moments, and lives! Why then do we feel it's okay to devalue a blog as it's only got 5 followers? If your lucky enough to have a blog with 1000+ followers that's brilliant and you should feel great for that fact but it doesn't mean you are any better than that blogger with 5 readers. We all started there at one point... Heck, I'm not far off that myself! Why don't we share our advice, secrets, and nitty gritty tips to help others get 'up there' too? I remember being stuck in a rut with my blog because I just didn't understand nor have the knowledge or know how about how I could improve it. I dare ask around incase of being shut down or felt be littled. So I ended up not wanting to blog because I knew where I wanted it to be but I struggled to get it there. Alas I met someone who was more than keen to offer her assistance and overall she has spent what must be hours helping me out and I couldn't be happier to blog now... But that was just ONE person/blogger out of many...something to think about? Please don't think I'm speaking about every blogger out there because I'm not. Maybe just once you yourself if your reading this could have helped someone out and didn't, devalued anyone with a smart remark, looked down on a smaller blog or even left a not so nice post comment. Just the slightest moment where you slipped up spoke before think (or typed in our case). Could you have dealt with that in a more polite/professional way'. I've probably done it myself even but I wanted to write about this just to make people aware that we are ALL the same whether you've been blogging for 5 years or 3 months. There's no need to have particular blogger cliques where no one else can join in unless they have white backdrops or walls, whether or not you get 'happy Mail' every day or even if you don't have snazzy camera or editing facilities. Ladies gents let's be friends, real friends. 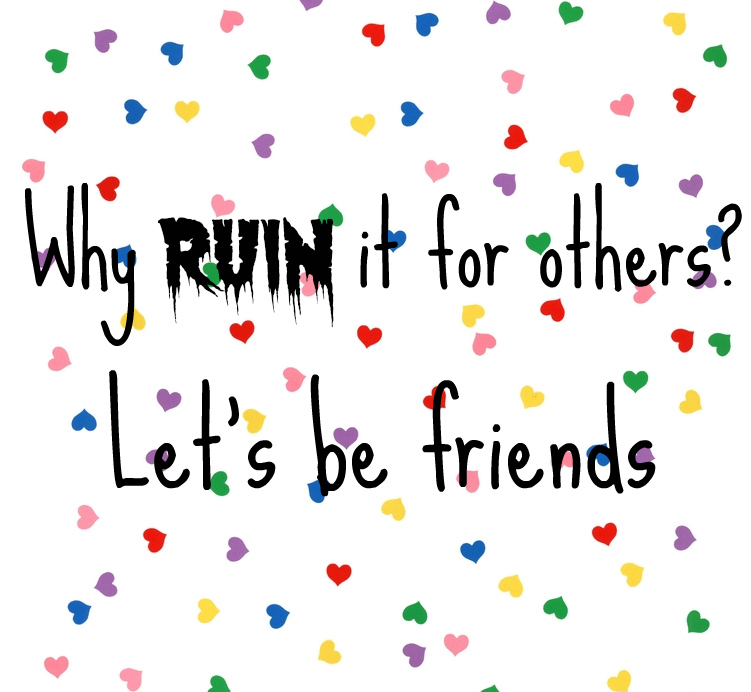 Don't ruin things for someone else. We are all entitled to our own opinions and are always free to share them but there is a way of speaking out without making someone feel 2 inches tall. Have you experienced any issues like this or am I just an over sensitive soul? Can I get a "Hell Yeah!!!" wow I think many others will agree with everything you said! This is going to a popular post me thinks!! Although I have not experienced this properly, and I am lucky enough to know a very popular blogger and she has helped me so so much and I am willing to help absoloutley any blogger out there if they need help. I've helped two people start a blog and i'll be helping another soon. I started blogging for myself and only the past few months reading others because I was still trying to learn myself how to blog 'properly' if that makes sense.